Pokémon games are usually filled with interesting characters, Trainers and both friendly and not so friendly NPCs. And Pokémon Sun and Moon are no different. Here's a quick overview of some of the people you'll meet on your island adventure. But first up: The most important person here. Namely you. 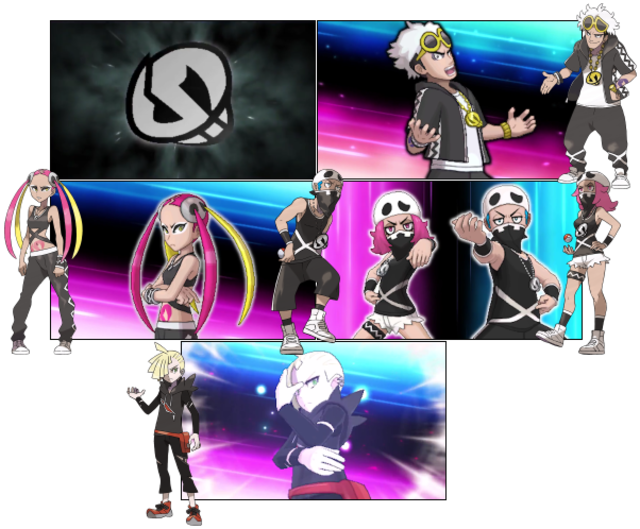 These are the player characters in Sun and Moon. You can customize your gender and appearance. The story begins right after your character has moved to the Alola region. No sooner have you arrived than your adventures begin to unfold, and you'll meet many people and Pokémon as you grow and learn. Hau is a Pokémon-loving young boy with a big appetite! He's the same age as your character, and is considered to be the player's main rival as he'll battle you several times during your shared ascent through to the Island Challenge. When you move to the Alola region, he makes friends with you right away. He has a real weakness for malasada, a famous treat in the Alola region, and he is always in search of malasada shops. He is a big-hearted boy who really loves Pokémon. Lillie is a mysterious girl who assists the professor. This young girl is about the same age as your character, and she's working as Professor Kukui’s assistant for personal reasons. She's not fond of making Pokémon fight in battles, but she loves reading and has devoured many books. Lillie will play an important role in the story. 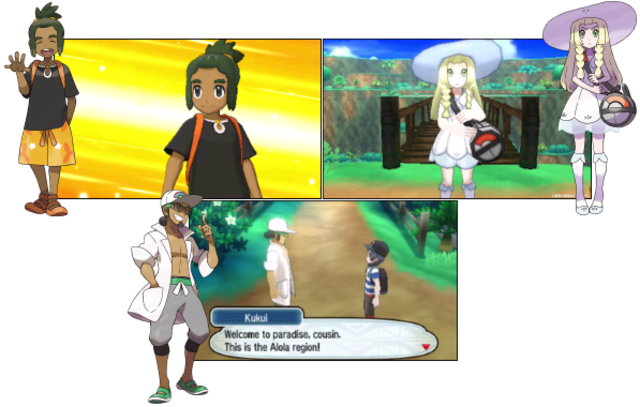 Professor Kukui is the Alola region's dependable Pokémon professor. He lives near your home and looks out for you. He's passionate about his research into Pokémon moves and has sometimes taken direct hits from Pokémon when there was something to be learned from it. Sporting a white lab coat slung casually over his bare torso, he shows off his own unique style. He's also quite interested in pro wrestling? Each Trial has a Trial captain, whose role is to provide guidance to Trial-goers. 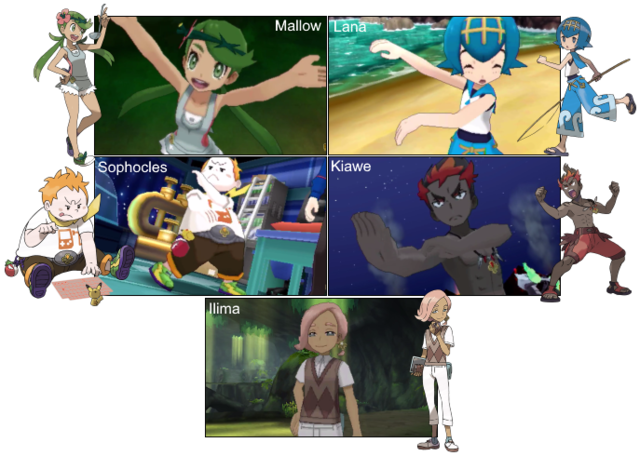 All of the captains are Trainers who undertook Trials in their own Island Challenge a few years earlier. Ilima is an expert in Normal-type Pokémon. He graduated from the Trainers’ School and is a hero to the students there. Some call him the Prince of the Trainer's School. He lives with his family in Hau'oli City on Melemele Island. Lana is an expert with Water-type Pokémon. She is dedicated to her family, with whom she lives in Konikoni City on Akala Island, and is a reliable older sister who watches over her younger twin sisters. Kiawe's expertise is in Fire-type Pokémon. Together with his Marowak, he studies the traditional dances that have been passed down in the Alola region. He lives in Paniola Town on Akala Island, but wishes to travel to another region to further his studies for dancing. Mallow is an expert with Grass-type Pokémon. She loves cooking, but it seems that sometimes her taste is a bit particular. She lives in the restaurant in Konikoni City on Akala Island, which is owned by her family. She would like to take over the family business someday. Sophocles specializes in Electric-type Pokémon. He is good with mechanics and has invented various machines, however, he is also quite shy. Sophocles shares a close bond with his cousin, Molayne, and has been picked by him to succeed him as Trial captian. Sophocles can be found in the Hokulani Observatory on Ula'ula Island. Next to being a Trial Captain, Sophocles is also the owner of the Festival Plaza. Acerola is an expert in Ghost-type Pokémon. She is a friendly young girl who often visits the Aether House on Ula'ula Island to play with the children and Pokémon there. She claims to be descended from Alolan royalty. Acerola's Father owns the Malie City's Library. Mina specializes in Fairy-type Pokémon and is an aspiring artists who started painting at an early age. However, she spends more time dedicted to her art than on her duties as Trial captian. Each of Alola’s four islands has a leader, called the island Kahuna, who governs the island. Kahunas are chosen by the Pokémon known as Guardian Deities, which are also found on each island. Hala is the Kahuna of Melemele Island, where you have just moved to, and is also your rival Hau’s grandfather. He lives in Iki Town, and his skill is renowned in the Alola region. Hala gives you your first partner Pokémon and expects great things from you. Olivia is the Kahuna of Akala Island, the second island you visit on your Island Challenge. Her skill is extraordinary, as can only be expected from someone chosen to serve as Kahuna at such a young age. Yet she still insists that she is just a normal girl. Next to being Kahuna, Olivia also owns a jewelry and accessory store in her hometown of Konikoni City. Nanu is the Kahuna of Ula'ula Island, the third island you set foot on during your adventure. Next to Kahuna, he is also a police officer and lives in the Po Town Police Station on Route 17, together with his Alolan Meowth. Hapu is the Kahuna of Poni Island, the fourth and last island you visit in Alola. She lives on the island with her grandmother and is chosen as Kahuna to succeed her recently deceased grandfather. 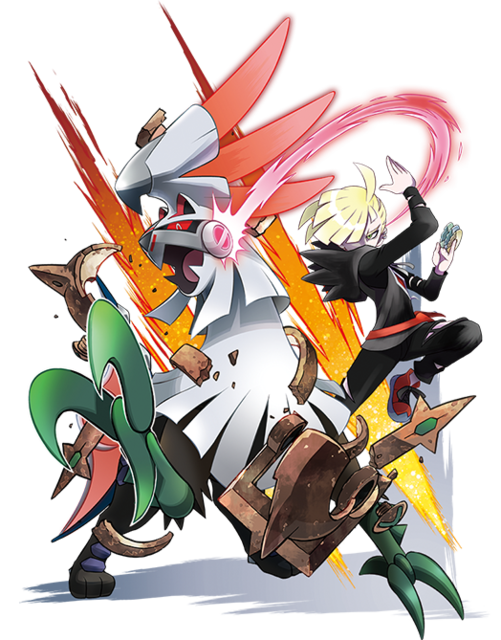 Gladion is a young man that lends his strength to Team Skull as an enforcer. He also serves as a rival of sorts to the player. He places a high value on being strong in Pokémon battles. His partner Pokémon is the mysterious Type: Null. 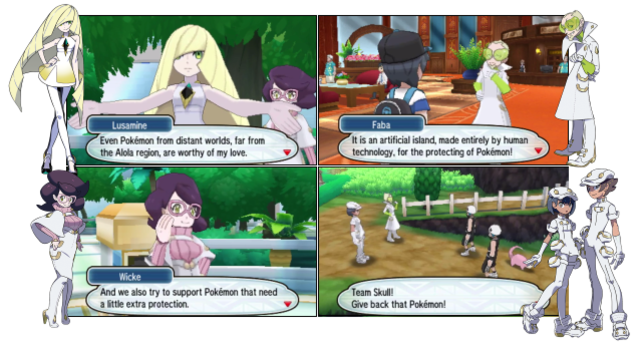 The Aether Foundation is a slightly omnious organization based in the Alola region whose goal is to shelter Pokémon to keep them safe from threats like Team Skull. Their headquarters is Aether Paradise, an artificial island they constructed. The lovely Lusamine functions as the Aether Foundation’s president and claims to love all Pokémon, be they native to the Alola region or not. Lusamine is assisted by Faba, the Aether Foundation's second-in-command and Aether Foundation branch chief, a positions he seems very proud of. He is identified by his signature green sunglasses. Wicke is the assistant branch chief of Aether Paradise. With her caring personality, she is loved by all the Aether Foundation employees. The Aether Foundation Employees shelter and care for Pokémon. They are mostly dressed in white, futuristic uniforms, but those appear to depend on which division they belong to. In the Alola region, rumors are flying about mysterious creatures known as Ultra Beasts. Ultra Beasts possess mighty powers and could pose a threat to humans and Pokémon, so they are feared. It appears that the Aether Foundation is also conducting research on these Ultra Beasts. According to rumor, multiple Ultra Beasts exist, each of them called by a code name. The Ultra Beast known as UB-02 Absorption appears in Pokémon Sun, and the extent of its strength is unknown. Its entire body is covered with bulging, powerful muscles. The full force of a punch powered by these muscles would be off the charts! Its distinctively long mouth is said to be harder than diamonds. Could the Ultra Beast also use it to attack? The Ultra Beast with the codename UB-02 Beauty appears in Pokémon Moon. What kind of power does it possess? Its narrow, graceful legs allow it to accelerate with such explosive speed that people claim it can dodge lightning! It is said that any Pokémon that sees UB-02 Beauty, regardless of its own gender, will become infatuated with it and lose the will to battle. The exact reason for this reaction—whether it's an unidentified pheromone exuded by UB-02 Beauty or a hypnotic effect induced by its appearance—has not been determined. 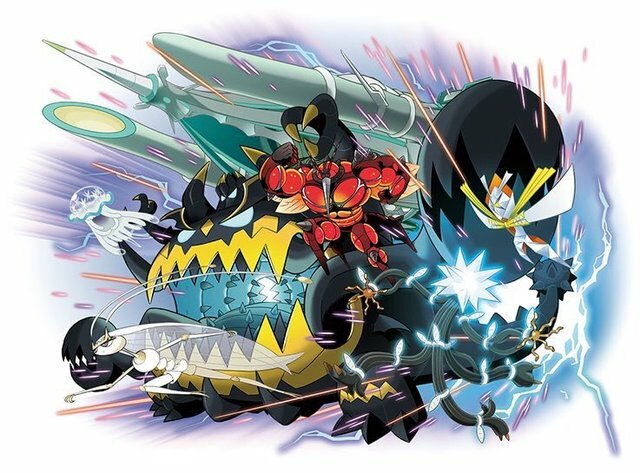 There's also rumors about other Ultra Beasts living in the Region – like UB-03 Lighting, UB-04 Blade, UB-04 Blaster and the nasty UB-05 Glutton. Only time will tell how many Ultra Beasts there truly are in this part of the world. Professor Burnet has a lab in Heahea City on Akala Island, where she researches the strange phenomena occuring in the Alola region: the Ultra Wormholes and Ultra Beasts. She is also the wife of Professor Kukui. Samson Oak does research on the regional variants that have taken root in the Alola region. He’s a cousin of the Professor Oak—the famous authority on Pokémon research in the Kanto region. The two could practically be twins! Mohn watches over Poké Pelago and helps you develop the various isles. Dexio and Sina will show up as you progress through your adventure. These two appeared in Pokémon X and Pokémon Y as the Professor’s assistants. They’ll give you an item called a Zygarde Cube and ask you to collect Zygarde Cores and Zygarde Cells during your adventure in the Alola region.